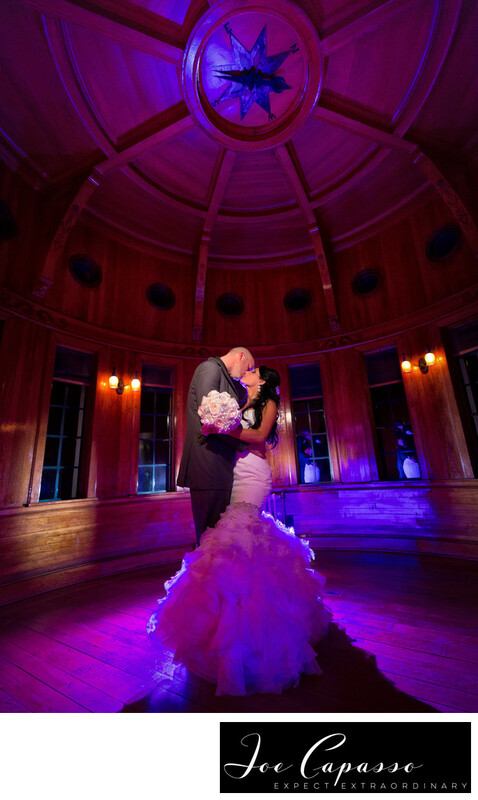 Jessica had her dream destination wedding with her groom Cameron at the Powel Crosley Estate. The property is a historical wedding venue that sits on the Sarasota bay front. In 1929, Powel Crosley Jr. built a Florida winter retreat on Sarasota Bay for his wife, Gwendolyn. The house contains ten bedrooms and the same number of bathrooms! This image was taken inside of the mansion's ship room. The room's name describes itself perfectly. It's built out of wood just like an old ship, and has port hole windows. The room sits on the corner of Crosley's mansion and provides a perfect view of the bay. This florida wedding venue pays tribute to a bygone era with it's jaw dropping architecture. However, inside, it's amenities are completely modernized. In 1991 the property was purchased by the state of Florida. It's on now the National Register of Historic Places, but the building can successfully host meetings, weddings, holiday parties, and other events. The Powel Crosley estate is well known as one of the more popular wedding venues in Sarasota, if not, the state of Florida. Not only do local brides seek out this beautiful wedding venue, but so do brides seeking to have that perfect destination wedding. The tranquil waters of the bay that sits out behind the mansion always makes for picturesque photo opportunities. The venue has ample space inside for many guests and large bridal parties. If you're expecting several hundred wedding guests, the mansion can easily handle your event by moving the wedding reception outside on the estate's massive lawn. Keywords: powel crosley (3), powel crosley estate (3), powel crosley estate wedding. museum wedding (3), powel crosley wedding (3), purple wedding (3), sarasota wedding (9), sarasota wedding photographer (3), wedding dress (3).